Class Fee: $35.00 pattern included. Payment due at sign-up. Skill Level: Intermediate, must have knowledge of knit, purl, long tail cast on and working in the round with double pointed needles. Supplies needed: One skein of Berroco Ultra Wool worsted weight, one tube of beads, size 6 double pointed needles, beading needle. 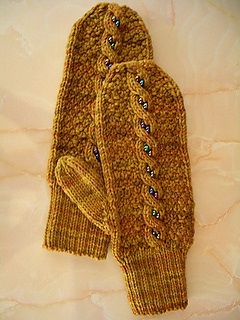 ﻿﻿Yarn must be purchased from Knit Two-Gether, you will receive a 10% discount on yarn for this class. There is homework required prior to first class, contact the shop for instructions.